Mexican artist Frida Kahlo’s Self-portrait with Thorn Necklace and Hummingbird (1940), one of the Ransom Center’s most famous and frequently borrowed works of art, is on display through July 28. Since 1990 the painting has been on almost continuous loan, featured in exhibitions in more than 25 museums in the United States and around the world in countries such as Australia, Canada, France, and Spain. View a map of where the painting has traveled in recent years. The painting was most recently on view in the three-venue exhibition In Wonderland: The Surrealist Activities of Women Artists in Mexico and the United States, organized by the Los Angeles County Museum of Art and exhibited subsequently at the Musée National des beaux-arts du Quebec in Quebec City and at the Museo de Arte Moderno in Mexico City. The painting travels next to The ARKEN Museum of Modern Art in Ishøj, Denmark, for the exhibition Frida Kahlo & Diego Rivera, running from September 7, 2013 to January 5, 2014. Kahlo (1907–1954) taught herself to paint after she was severely injured in a bus accident at the age of 18. For Kahlo, painting became an act of cathartic ritual, and her symbolic images portray a cycle of pain, death, and rebirth. Kahlo’s affair in New York City with Hungarian-born photographer Nickolas Muray (1892–1965), which ended in 1939, and her divorce from artist Diego Rivera at the end of that same year left her heartbroken and lonely. But she produced some of her most powerful and compelling paintings and self-portraits during this time. 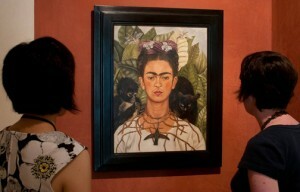 Muray purchased the self-portrait from Kahlo to help her during a difficult financial period. It is part of the Ransom Center’s Nickolas Muray collection of more than 100 works of modern Mexican art, which was acquired by the Center in 1966. The collection also includes Kahlo’s Still Life with Parrot and Fruit (1951) and the drawing Diego y Yo (1930). 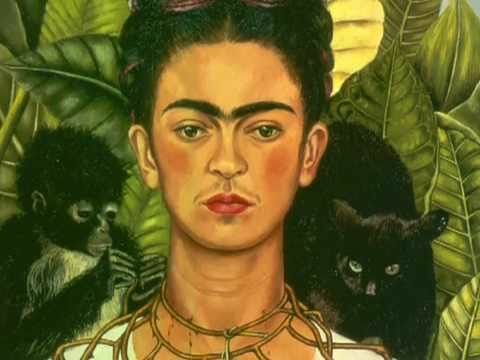 View the video documentary “A World of Interest: Frida Kahlo’s Self-portrait with Thorn Necklace and Hummingbird,” which highlights the painting’s return to the Ransom Center.